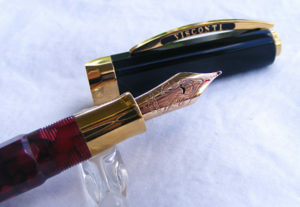 Ah, Visconti, how I love thee! 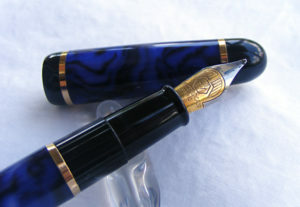 The fact that I am a bit of an Italian history buff just adds to my love for these pens. (Sidenote: in the Middle Ages, the Visconti coat of arms was a basilisk devouring a child. (see it here) Ghastly, right? But even today, you can see that greedy serpent on the front of any Alfa Romeo. True thing, go look up the Alfa Romeo logo if you don’t believe me!) 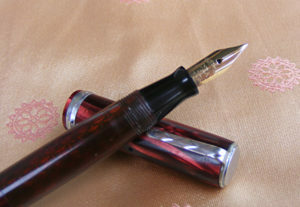 But back to the pen: This pen is pen lust embodied. 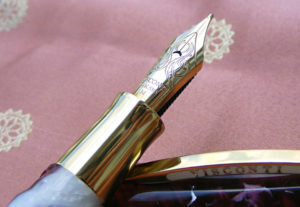 Crimson marbled with gleaming gold, a big, engraved nib that writes like silk… It’s love! I think the Club series was a limited edition, and I have only ever seen one other like it for sale. I keep this one inked up with my other Italian love, Dante Alighieri, the ruby red ink from De Atramentis, although I have found that with the Noodler’s Eel ‘Rattler Red,’ I get even more expressive writing from it. Do I need two Visconti Operas? Well, sure! 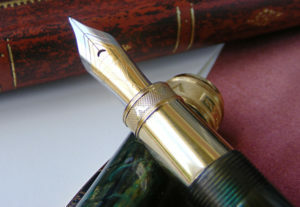 These are just such stunningly luxurious pens, they seem almost decadent to own, never mind use! Still, I use them often, because they just feel so darned good in the hand. This is from the “Elements” collection, and is much like its cousin below. However, this one features a nifty ‘twist-click’ cap mechanism that I really like. And naturally, a dream to write with! Have I mentioned I love orange pens? So when the Rembrandt calligraphy kit showed up in my inbox in one of FPH’s ‘special sales,’ I leapt. Boy, am I glad I did! I know Viscontis get a lot of flak, but I adore them, and this is no exception. I will say the flex nib isn’t all that flexy, especially in contrast to a genuine vintage flex nib, but it’s a nice nib for practicing. And the italic is fantastic! Much better flow than any calligraphy italic I’ve used. Nice solid piece, with a nifty magnetic click-lock cap. This is one of the first set of VanGogh pens, before they were based on specific paintings, and personally, I liked that series better than the newer ones. It’s a solid, hefty pen, with a shimmering finish. 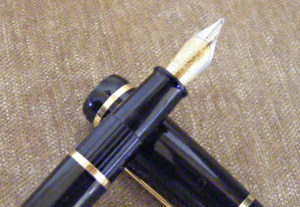 Plated nib, but still an excellent writer, especially now that it has been given the famed Pendleton Point ‘Butter-line Stub’ treatment. Shimmering green with golds and browns – no photo will do it justice. Nice weighty feel in the hand, and holds loads of ink. Fantastic spring-loaded clip, too. 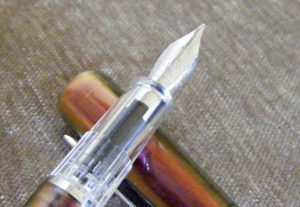 I had to put a quarter in the nib shot, so you can get an idea how impossibly dainty it is! The nib is fairly flexible (though falling well short of what I’d call ‘wet-noodle’) and writes a gorgeous copperplate script, and puts down a nice smooth line without variance as well. Pencil still has lead, and these darlings are in such beautiful shape! With the original blue velvet box, with vintage Waterman’s instructions! This may be one of those great writers that’s not as showy as some other pens. It’s a nice steel-grey marble shot with russet, with silvertone appointments. 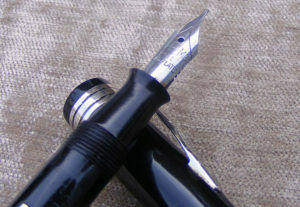 But the nib is a smooth, flexy champion. Does gorgeous copperplate style script, or it will with practice…. Same exact pen as the Orange, but with a green, blue, purple shimmer. (Yes, there was a nail polish like this, too! 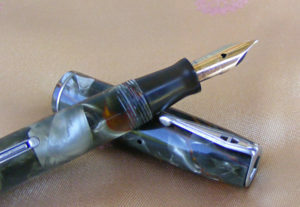 LOL) These are both stunning pens, and generally solid writers. his is essentially a simplified (in other words ‘cheaper’), version of the Phileas. Solid reliable, no muss no fuss pen. What gets me it the colors in the Reflectis series! It says Orange, but really, it’s orange, red, pink, gold, even hints of green in certain lights. (This may be a crazy way to describe it, but Sally Hansen made a nail polish called Amber Ruby that had the same multi-color, iridescent shimmer, and I loved that, too. Very eye-catching finish! Clear section and feed. 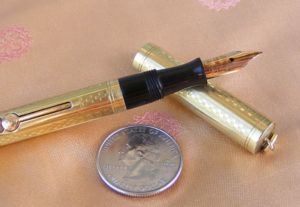 Another tiny jewel from Waterman. This one has the ‘Ink-Vue’ barrel, and a modified double-action lever/bulb fill mechanism. In superb shape, with great clarity, no discoloration. After finally realizing the virtues of my blue Phileas, I leapt at the chance to grab another one when a member of FPN was selling the kit for around $30. Oddly, it doesn’t *quite* behave as well as the blue, but it’s still a great little pen. I bought this pen for a relative over 15 years ago. She gave it back, so I gave it to my mom, and SHE gave it back! Now that I’ve messed with it again, I’m not sure why I kept giving it away. It’s a nice solid little pen. Granted, it’s fairly lightweight plastic, and the marbling isn’t exactly subtle (I think it’s a printed design, but I can’t be sure), and the nib is steel, which is generally not my preference. Still, it’s a smooth and reliable writer, fairly wet, not skippy or scratchy. 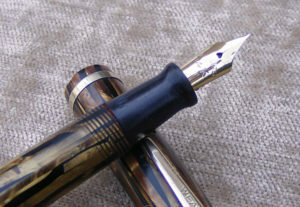 A good pen to take along when I’m just out and about, and would be afraid to take some of my treasures. I just love the finish on this pen. I’ve seen this ‘tiger stripe’ in green and grey, but the bronze really works. A lovely little writer, too! The pen/pencil duos absolutely fascinate me! 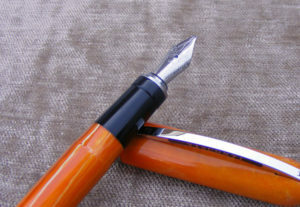 This is a lovely example, with a stunningly smooth nib for a third tier pen, and a pencil that advances perfectly. A smart, and very ‘deco’ looking combo! This one ends up getting used a lot, and never fails to get comments. 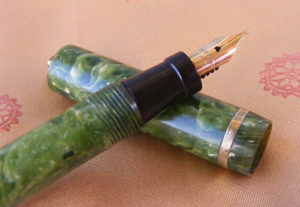 This pen may have some of the best coloring for 1920s jade celluloid I have ever seen. It’s absolutely brilliant. Some brassing to the cap band and lever, but minimal wear. 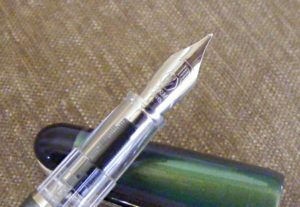 Has a good sac and the nib is a smooth writer, now that I’ve managed to sweet talk the tines into proper alignment.